This is by far my FAVORITE macaroon recipe I’ve made. 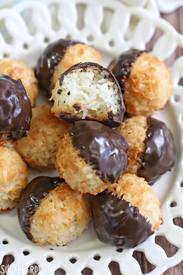 There are different methods for making macaroons, and I’ve tried them all. There are variations with sweetened condensed milk, or where you just stir everything together before baking, but to get the taste and texture that I personally love, I find it necessary to cook everything together on the stove top before shaping and baking them. It’s a small change, but it gives the cookies my ideal texture: crunchy and golden brown on the outside, but still really moist and soft on the inside. Now, like with all things in life, I think they’re better when combined with chocolate. Seriously, name me 3 things that are NOT improved with chocolate. I’ll wait. I like my macaroons shaped into cones or balls an half-dunked into bittersweet chocolate, but some people like dunking the whole thing, or just dipping the bottom in chocolate. If you can handle serious sweetness, another surprisingly good combination is coconut and butterscotch chips–be sure to add an extra pinch of salt if you go this route.